You’re hopefully excited about having your girls come to live with you, but before you collect them we want you to be well prepared, so have a good look at some of the frequently asked questions below. Or, use the search facility to find an answer to your question. The minimum number of hens you can reserve is three because hens are sociable and like to be part of a flock. 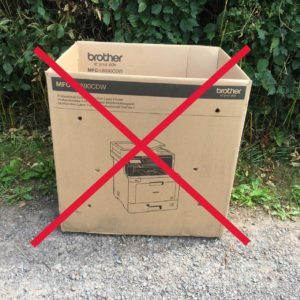 However, we will allow you to adopt two if you already have hens, or if you are housing your birds in an Omlet Eglu as these are suitable for a maximum of two hens. The maximum number of hens you can adopt is 20, and they must all stay together with you. When can I get my hens? We are dependent on farm slaughter dates when arranging hen collections. However, our volunteer teams around the country usually have hen every four to six weeks. Take note! The girls are popular so please don’t leave it until you have everything in place before you phone or you may have to wait. Please call us ASAP on 01884 860084 if you want to reserve hens. What will the hens cost? We like to think you are not buying a hen, but adopting a family pet and as a bonus your pet will lay eggs for you; clever girl! What could you spend your money on instead (given that six eggs cost around £1)? When do I make my donation? We ask for donations in advance of collections to save our volunteers having to cash up at the end of what is often a long and exhausting day re-homing hens; it also avoids them having to take donations to a bank. The majority of our volunteers have full time jobs, so we want to make their volunteering easier and ensure your funds reach the charity promptly. If for any reason you have donated in advance for your hens but cannot collect them on the day, you will be given the option to transfer your donation over to a subsequent re-homing or have it refunded. What accommodation will they need? You can convert a regular shed or outbuilding, build your own coop, or buy a purpose-built hen house. Design, prices, quality and sizes vary hugely so do some research. It is far better to pay more for a sturdy, well-built house which will last for years, than buy a small, cheap, thin-walled coop which will soon fall apart and need replacing. You also need to decide on your preferred system: keeping the hens in a smaller house with attached run, frequently moving it onto a fresh area of lawn or ground or building a larger permanently-sited aviary type enclosure. Most new coops and runs will have manufacturers’ recommendations on stocking rates; we advise you buy a hen house to accommodate more hens than you want. For example, if you want four hens, buy a hen house to accommodate six, then you can be sure there will be sufficient room. If you are unsure on numbers we will advise you. Foxes are attracted by hens; they will visit night or day and will kill your birds if they are not secure. They jump and climb like cats, so a standard 6′ or 7′ perimeter garden fence alone is not guaranteed to keep them out. Where can I get the equipment I need? Our online shop has all you will need to start keeping chickens including a good range of books, feed, supplements, equipment, as well as chickeny gifts. Our one stop chicken shop helps to fund the re-homing of thousands of hens each year, so please spend generously! What breed are the hens? The hens are all commercial hybrids: Lohman Browns, Goldlines, Hylines or Isa’s, all of which are Rhode Island Red crosses. They are approximately 17 months old when we collect them from farms, and are off to slaughter because they are deemed no longer commercially viable as they may be laying fewer eggs. As well as hens from enriched cages (40-90 hens per cage) we also collect barn hens & some free range hens. These hybrid hens are bred for docility and you will find they are gentle, inquisitive and friendly, eating out of your hand and following you around the garden and into the house if you let them! We never knowingly pass on a poorly hen and any that concern us are either retained until well enough to be adopted or in most cases join small flocks of special hens kept by our teams. However, sometimes limping hens can be re-homed if you have the experience, patience and facilities to rehabilitate them. Should you have an indoor area such as a barn, stable or outbuilding and are willing to adopt hens needing extra help, please mention this when you call or when you arrive on collection day. Please note: all commercial farmers vaccinate, worm and salmonella test their birds as their eggs form part of the human food chain. However, these vaccinations do not always offer lifelong protection. Most hens will go on to enjoy a long and happy free range retirement. However, these hens have worked hard for around 18 months and whilst we never knowingly re-home a poorly hen, as with any animal, some will have a shorter lifespan than others. Because we cannot guarantee lifespan (as with any animal), occasionally a hen may die soon after adoption, which we know will be upsetting. Whilst we try our best to avoid this happening, we hope you will appreciate that your hen has at least experienced kindness outside of the commercial system which is more than she could have ever hoped for. When adopting any pet it is good practice to register with a vet and not wait until you have a problem, and here you will find our list of hen friendly vets. What happens if I have problems with my hens or can no longer keep them? It is not uncommon for hens to limp a few days after adoption. This is often a result of handling at the farm and/or weak legs. Do not remove the hen from the flock unless bullied, but ensure she can access food and water. Limping and bruising usually subsides within two weeks, please call our Advice Line on 01884 860084 if you are concerned. We are always on the end of the phone, no matter how long you have had your hens. If you no longer feel able to look after your hens, call us. We will endeavour to take back the birds and find a new home for them where possible. Will my hens lay eggs? 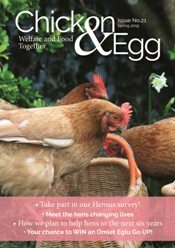 The charity cannot guarantee the future laying capability of any individual hen, but most will carry on laying provided you feed them with a high quality feed (we recommend the Smallholder Range by Allen & Page) and do not give them too many treats, which can upset their nutritional balance. Whilst eggs will increase in size over time, it is likely they will decrease in numbers. Egg shell quality may decrease as hens get older and soft shelled eggs may be seen; this can be improved by using egg shell improver. Finally on eggy info, be aware your hens are not used to finding and using a nest box and initially will lay their eggs wherever they happen to be! Do I need to keep my new hens separate? Hens will usually need to be kept separate from your existing hens for a short period, please ask our advice on this. Some hens may be a little underweight and lack confidence when they first come out of the farm, others are spirited and think they rule the roost from day one! It is also sensible to quarantine your new birds initially for up to two weeks. This will make final integration easier though there will always be some squabbling as a new pecking order is established. We always advise you adopt a greater number of hens than you currently keep, so if you already have three hens, make sure you adopt at least four new ones, which gives the incoming hens advantage in numbers over those who are already familiar with your routine. It won’t take them long to realise there is more to life than squabbling.If you have on-going bullying problems read our advice on merging and establishing a new flock or call us on 01884 860084. Please note: hens need keeping apart from cockerels for at least a month; the girls can easily be damaged as they may have weak legs and bald backs when first out of the farm. These hens know little fear and will get along happily with cats, dogs, sheep and even llamas which act as great fox deterrents. If your existing pets are friendly, controllable and the introduction is supervised there shouldn’t be any problems. However, always supervise introductions and do not allow pets to mix until you are sure they will get along well. Will they know to take shelter? Initially hens will not know how to shelter and may stand outside when it’s wet and windy, so you may need to physically put them in the coop if the weather is inclement. If you are re-homing during the summer months and you have hens with bald backs or heads, you may need to put sunblock on their skin on strong sunny days. You can buy sunblock suitable for pets. Here are our Hot Weather Tips. If re-homing in the winter, look at our Cold Weather Tips. What happens on hen collection day? We do not normally keep hens in stock; we take them out of the farm early in the morning, put them in crates and take them to the re-homing point for a health check. Adopters arrive later the same day. This way all the stress for the hens is confined to one day and they will go from cage to new retirement home in a matter of hours. There can be up to 50 adopters arriving to pick up hens on hen collection day, so please be patient if there is a short queue of cars or a wait when you arrive. How do I carry them home? We want your hens to travel home in comfort and safety, it’s been a long day for them! 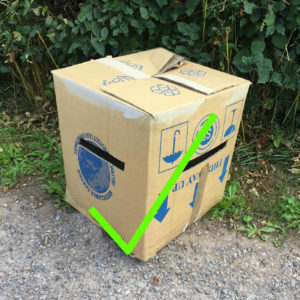 A hen is about the size of a football so please bring either straw/newspaper lined cat carriers or dog crates or similar sized sturdy cardboard boxes with horizontal ventilation slits around 1 x 6 inches cut into the sides – please note stab holes are not sufficient! See below for examples. Crates and dog cages also need a base or cardboard in the bottom to prevent the hens getting their nails caught as the crate is moved. For their welfare, we do not allow hens to be driven home in enclosed saloon car boots. Please take the trouble to organise this as you may be refused hens if you do not have adequate transportation. What do I do with the girls when I get them home? When you get your girls back home we advise you put them in their hen house initially so they get accustomed to where “home” is, but allow them outside access straight away provided you have a fenced area. Initially you may need to herd them in as darkness falls (or if it rains) and tempt them out again in the morning. But it won’t take them long to get the hang of free range retirement! The BHWT recommend Smallholder Range Natural Free Range Layers Crumble and Natural Free Range Layers Pellets, both of which are available from our online shop. This feed is unique in that it’s GM and soya free. Both Smallholder Range Layers Crumble and Pellets can be fed to all poultry and provide all the nutrients your hens need. Caged hens will have been fed a dry mash all their lives, so the Crumble is the perfect feed as they start their free range future. Allen & Page, manufacturers of the Smallholder Range, are continuing to support our work by making regular donations to the charity for each bag of Natural Free Range Layers Crumble and Pellets sold so help us to raise funds for the charity. It is fine to feed a small amount of mixed corn in the afternoon; this will guarantee they go to sleep with a full crop. Do not overfeed your hens with treats or scatter food on the ground as this will attract mice and rats and may adversely impact egg production. Click here for more information on feeding and hen treats. Hens have no teeth and food is held in a pouch at the bottom of their neck called a crop, where it is ground up before passing to their stomach. As some ex-bats have few feathers, the crop may be visible, especially late in the day when it is full of food and swollen. This may look like a “lump” or “growth” and has occasionally alarmed first time chicken keepers; please be assured it is normal and will have shrunk by the morning. 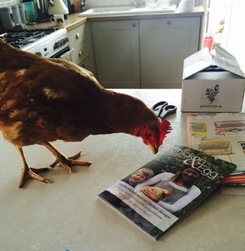 Your hen has just enjoyed her first free range meal! Why do I need to register with DEFRA (now known as The Animal and Plant Heath Agency (APHA)? Registering poultry with DEFRA/APHA is a legal requirement for anyone with 50 or more permanent birds, and all poultry owners are encouraged to register on a voluntary basis. Advisors will complete the form over the phone and then a completed copy will be sent to you.They’re open 8am to 8pm weekdays and 9am to 1pm weekends. Website – visit Defra’s website to download a form which can then be emailed to them. If you have been unable to find the information you need please don’t hesitate to contact us here at Hen Central on 01884 860084 or email us at hens@bhwt.co.uk.